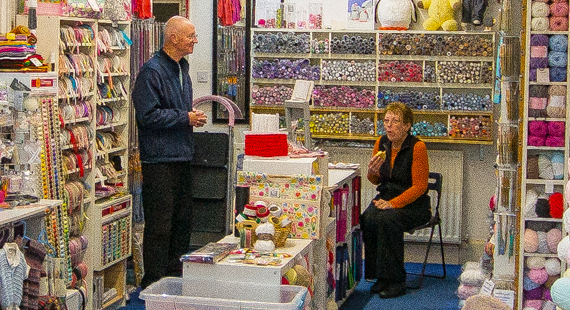 We opened our doors in April 2011 in Scholes village. But because we needed more room, in January 2014 we moved to the centre of Cleckheaton. Our aim is to provide you with a variety of wools and knitting products to suit your purse, from the popular economical yarns through to good quality brands. Browse through our knitting patterns at your leisure; wander around and choose from our colourful range of beautiful wools; examine swatches made up from our own stock to help you make your selection. Help is always at hand! We do not pretend to have everything you may require but our stock is constantly growing and changing. The Shop is Open: Mon/Tues/Thurs/Fri (9:00am - 5:00pm), Wed (9:30am - 3:00pm), Sat (9:00am - 4:30pm). Parking is available right opposite the shop in the public car park (free for 4 hours) on the main road. We meet every Tuesday and Wednesday 10:00am - 12:00pm and every alternate Tuesday 7:00pm - 9:30pm.